The graph says a lot. It tells you there are two clear standouts in right field and that they’re followed by two lesser, but distinct tiers of right fielders before the league sort of blends together. While there are a few teams that look quite poor on the far right, it’s a pretty consistent decline across the board. 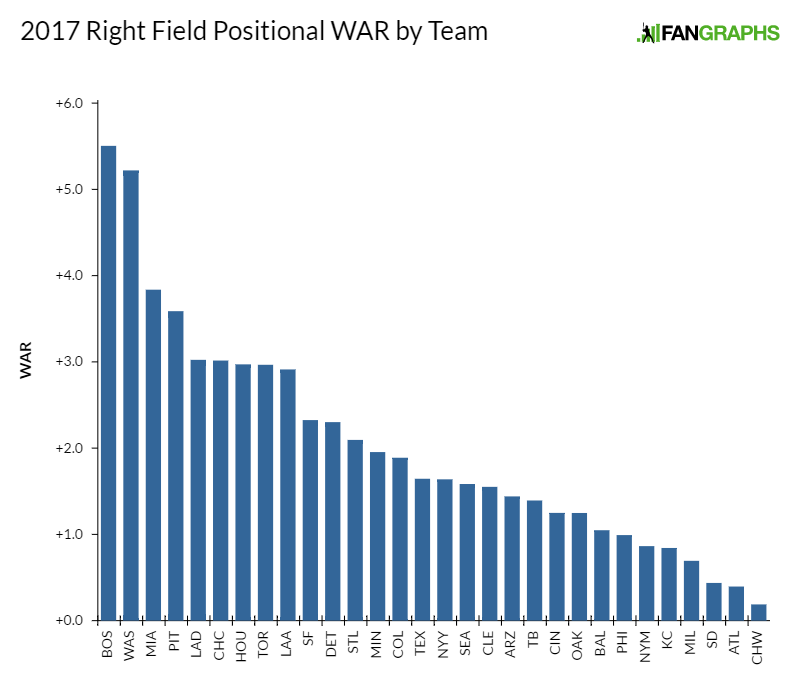 What the graph doesn’t tell you is that two clear stories emerge as you study this year’s crop of right fielders. The first story is that there are a lot of extremely talented right fielders coming off down years. Bautista, Harper, Heyward, McCutchen, Puig, and Stanton represent six of the top eight right fielders based on our projections. All of them had disappointing 2016 campaigns. The other story is a group of young right fielders who have tremendous power, but haven’t shown an ability to utilize it consistently in the majors. Think Judge, Mazara, Renfroe, Santana, Soler, and Souza. A year ago it might have seemed ridiculous to think Bryce Harper wouldn’t be leading this list, but a lot can change in a year, and there’s plenty of reason to imagine at least one of those power-hitting guys in the back half of this list could jump the field and wind up near the top in 2018. If you were one of the people who forecasted great things for Mookie Betts entering 2015, you probably took a victory lap last offseason. After all, Betts hit .291/.341/.479 (119 wRC+) while playing a solid center field and running the bases well. Betts delivered a 4.8 WAR season in 2015, proving those who doubted his potential wrong. Yet somehow that victory lap was a year early. When the dust settled on 2016, Betts was a bona fide MVP contender, falling short of winning only because Mike Trout exists. Even in a season with more overall offense, Betts raised his wRC+ by 16 points thanks to a huge power spike, riding good defense and baserunning to nearly eight wins. A year ago, Betts was a textbook case of a good all-around player who was probably a little underrated. Today, there’s a case to be made that he’s one of the best dozen players in the league. If Betts needs a hand in right field in 2017, Chris Young will likely provide such assistance. While you’re more likely to see Young gather plate appearances in left field or center field when lefties are on the mound, he seems capable of crushing left-handed pitching even if he’s asked to play right field from time to time. Young had his best offensive season on a per-plate-appearance basis in 2016. While the projection systems don’t think his BABIP spike will repeat, his power makes him a threat. Imagine setting a career high in stolen bases, cutting your strikeout rate to a career best, and finishing with 3.5 WAR only to be immensely disappointed in your performance. Such is the life of Bryce Harper, who followed an otherworldly 2015 with a 2016 that was merely good by mortal standards. One does find a correlation between the four-games series in May when the Cubs walked Harper at nearly every opportunity and Harper’s loss of mojo, but it likely oversimplifies a more complex evaluation of the former MVP. Many of us treated 2015 as a sign of Harper reaching his potential, but looking back we might say that he’s still developing and that 2015 was an early career spike rather than an arrival at some sort of plateau. No one is betting against Harper after he failed to repeat in 2016. Our expectations are probably more in line with what we should expect from a superstar on the near side of his emergence rather than someone who has arrived into conversations about Barry Bonds. Harper will be out there nearly every day that he isn’t injured, but if that would happen to occur, Michael Taylor would be the most logical choice to fill his shoes. While Taylor is only seven months younger than Harper, he’s about 2,000 MLB plate appearances behind and they haven’t been great. Taylor caught our eyes in late 2013 and 2014 as he started to shine in the minors, but he hasn’t been able to translate that into much at the major-league level. He has the power and speed necessary to stick in the majors, but his control of the zone has held him back, having recorded just 52 walks to 252 strikeouts with the Nationals across three seasons. Durability has always been a question for the Marlins’ Giancarlo Stanton. Until last season, though, the club was generally able to count on Stanton to perform at an elite level when he was on the field. From 2010 to 2015, Stanton posted a 146 wRC+ across 2,958 PA. Yet, in 2016, he played in just 119 games and failed to distinguish himself. Stanton was only 25th in baseball by isolated power (min. 300 PA) in 2016. While that sounds good, it represented a pretty substantial step back for Stanton, who led the aforementioned second-place Harper by 22 points in 2015. In a year during which the entire league hit for a lot more power, Stanton hit for a lot less. With Stanton, it’s hard to tell the extent to which injuries played a role, but Giancarlo Stanton with just pretty good power is a much less interesting player than a Giancarlo Stanton with elite power. For the sake of the Marlins and baseball fans outside the NL East, let’s hope he’s the former in 2017. If he isn’t, the fallback option to which we’ll be treated is Ichiro. And Ichiro is delightful, even at 43. Ichiro got plenty of attention last year for crossing 3,000 MLB hits and passing Rose in total hits across MLB and NPB, but that shouldn’t disguise the fact that he had his best offensive year since 2010, a season in which he was still a star in Seattle. This isn’t the Ichiro who will steal 40 bases with great defense, but he was essentially a league-average player at age 42 last year, and there’s no reason why he shouldn’t be able to do that again if needed. Most players in the league would be happy with 24 home runs and a .336 OBP, but Andrew McCutchen is not most players. Prior to 2016, he was clearly one of the best players in the league and had positioned himself for a chance at enshrinement in Cooperstown. His 2016 season doesn’t necessarily change any of that. Great players have down seasons, and nothing seemed to go quite right for McCutchen last year — particularly during the middle of the campaign. With offseason trade rumors and a move to right field slated for 2017, McCutchen will likely take the field with something to prove for the first time since arriving on the scene in 2009. If one of the Pirates’ three main outfielders goes down with an injury or needs a blow, first baseman Josh Ball or backup Adam Frazier will likely be the first ones to get the call. Bell provides a compelling offensive profile, particularly his command of the zone — which was exceptional in his 2016 cup of coffee — but he’s probably not going to be a defensive asset in the outfield. Frazier’s no slouch, either, although the part of his game that lags behind is arguably one of the more important aspects of a corner outfielder’s game: power. Frazier makes contact, sprays the ball around, and puts his legs to good use on the bases and in the field. As long as the Pirates don’t need him to deliver a pinch-hit dinger, he should provide some solid insurance as he works his way into a more prominent MLB role. If opportunities exist later in the year, Austin Meadows might not be far behind. For many years, I asserted that the most compelling player in baseball was Ryan Raburn — not because he was the best, but because the range of possible outcomes on any single play was the widest. Raburn hit 430-foot grand slams and turned turned lazy fly balls into home runs for the other team. Yasiel Puig is a player in that same tradition. Puig entered MLB in 2013 and immediately became one of the league’s must-watch players. Over his first two seasons, he accumulated 9.5 WAR in 1,072 PA and was involved in all sorts of highlight plays. Since then, Puig has struggled in a number of ways, and when a player’s wRC+ is in the 110 range, it’s much more difficult to laugh off mental errors on the other side of the ball. Puig even found himself in the minors last summer, before a good September showing got him onto the postseason roster. Puig’s talent is not in question; whether he can generate consistent results is still up in the air. The Dodgers have a few options if Puig is unavailable. You may see Andre Ethier slide back over from his spot in left field, but the true backups are likely to be Franklin Gutierrez and Trayce Thompson. Gutierrez is known primarily for his ability to get injured in creative ways and his exceptional early career defense. But Gutierrez has turned himself into something of a platoon masher over the last couple of seasons, and that could prove useful off the bench for the Dodgers against some of the league’s tougher lefties. Thompson is a gifted athlete from a gifted family, and while he continues to possess potential, the Dodgers probably won’t be counting on Thompson to provide a ton of value in 2017 after last season’s back injury. Make no mistake, Jason Heyward is a defense-first player. His ability to save runs in the outfield is what makes him a star, but prior to 2016 he was also a very solid hitter. In four of his six seasons from 2010 to 2015, Heyward had a 120 wRC+ or better, so it’s not like the Cubs handed him $180 million simply because he has a good UZR. That being said, Heyward didn’t make that argument easier in 2016 by having far and away the worst offensive season of his career. A lot of his peripheral numbers were pretty normal, but a drop in power and a low BABIP did him in from a results standpoint. The Cubs were the best team in baseball last year with dreadful hitting from Heyward, so even a modest recovery will add wins the club probably doesn’t need. While Ben Zobrist is technically everyone’s backup in Chicago, he’ll get most of his chances at second base, which Craig Edwards covered yesterday. If you see someone other than Heyward or Zobrist in right field, chances are it will be Albert Almora, who got his first taste of major-league action in 2016. If you can make contact at a league-average rate, which Almora did, and post a .179 ISO, you’re in position to be a very useful big leaguer. Almora is held back by his unwillingness to walk, but if he can improve a bit in that department, his defense, contact, and power will make him a good piece off the bench in 2017. Josh Reddick doesn’t exactly fit the Astros mold. He’s become less of a fly-ball hitter over the last two years and has cut down on his strikeouts over the same period. It’s probably wise for the Astros to have diversified their targets over the last couple years, and Reddick should offer them a league-average-type season, thanks largely to his ability to deliver against right-handed pitching. George Springer is listed second on our depth chart in right field, but that’s a little misleading because this is really a reflection of Jake Marisnick being slated to take a number of lefties off the plate of Reddick, leading Springer to slide over to right field. Marisnick is about to turn 26, and his wheels have kept him in the show, but at some point he’ll have to hit if he wants substantial playing time on a contender. There were signs of life in his bat in 2015, but last season he was simply unable to hit the ball with much authority or get on base with much regularity. If we were talking about some generic power-hitting corner outfielder, we might chalk up Jose Bautista’s 2016 struggles to age and call it a day. After all, Bautista is 35 and plays on an artificial surface. But Bautista’s entire career is an anomaly, and few players prepare for and play this game with more of an edge that Bautista. He struck out more in 2016 than he had in years, and the power was a step below. He looked good down the stretch, though. If he’s healthy in 2017, he’ll be motivated to rectify the bad habits of the previous year. In particular, Bautista found himself swinging and missing at pitches outside the zone more often last year, perhaps a sign that he’s lost a bit of his ability to strike borderline pitches. Given his exceptional eye, a bit of an adjustment to his approach could go a long way. Bautista’s primary backup is likely to be Dalton Pompey. Pompey can run and his defense gets good marks; the question will be the degree to which he can get on base. In the minors, he’s shown an ability to walk and spray the ball around for singles and doubles, but his lack of power might put him at a disadvantage once he gets regular chances in the show. So far, he’s only seen a little major-league action, so it’s all theory at this point. So far this list has featured a lot of really good players coming off down years. Harper, Stanton, McCutchen, Heyward, and Bautista are all huge names who struggled for one reason or another in 2016. Kole Calhoun is cut from a different cloth. Calhoun is consistently underrated even after completing his third consecutive four-win season. While Calhoun has been a solidly above-average player in each of those seasons, he did take a little different path to that value in 2016. He was a bit less of a home-run threat while also increasing his walks and cutting his strikeouts. He’s entering his age-29 season, so you can probably count on him to do something similar again in 2017 as he continues to play in the shadow of the game’s best player. While Ben Revere is likely to get more of his playing time in left field complementing Cameron Maybin, he should see a bit of time in right field, as well, and would be in line to fill in for Calhoun if he went down with an injury. Revere had a dreadful 2016, posting a 47 wRC+ for the Nationals after three straight years above 90 wRC+. He’s someone who lives and dies with the ball in play, as a very small portion of his plate appearances end in walks, strikeouts, or dingers. If he doesn’t post a decent BABIP (.234 in 2016), he has virtually no way to help his team. He put the ball in the air too much (26.5% fly-ball rate), and his limited power means that he cannot make any money up there. If he finds his balance, slapping ground balls and line drives around the field in 2017, he could easily find his way back to an 85-95 wRC+, offering some value as the Angels’ fourth outfielder. Hunter Pence has one of baseball’s more interesting personalities to match one of its more consistent stat lines. For years, you could put him down for 25 home runs and around a four-win season, but he’s run into injury issues in each of the last two seasons. While he’s generally looked like himself when he’s been on the field, he’s only had 665 plate appearances since the beginning of 2015. Additionally, while Pence has performed on par with his track record over those two years, he has started to swing and miss more often, running a contact rate in the 71-72% range rather than his previous 76-77% comfort zone. It probably isn’t wise to make too much of that trend given the injury context, but it’s something to watch as Pence enters his age-34 season. Gorkys Hernandez has worked his way through about a quarter of the league since his days as a reasonably interesting Tigers prospect. While his major-league numbers aren’t going to win him a starting job, he’s put together a couple of nice Triple-A seasons for the Pirates and Giants over the last two years. He still runs well and his command of the zone has looked better in recent seasons, so if Pence has another injury-shortened year, he’ll get a chance to demonstrate whether he carry those improvements into the big leagues. This is ultimately going to come down to J.D. Martinez’s health. As I write this, the Tigers are getting a second opinion on his ankle. If it’s no big deal, he’s going to be one of the best hitters mentioned in this article. Since reinventing himself in 2014, he’s gone 154-137-142 in terms of wRC+. While his defense has been a little up and down, it takes a lot to erase that kind of production. If the Tigers have to rely on someone other than Martinez for a significant stretch of time, they might be in trouble. While Tyler Collins, Mikie Mahtook, and Steven Moya aren’t a terrible cohort to split fourth-outfielder duties, you might recall that these are also most of the players fighting for the center-field job along with JaCoby Jones. The Tigers are already playing it fast and loose with the number of outfielders required to field a contender, and losing Martinez would likely be devastating. If you happen to look at Stephen Piscotty’s 2015 and 2016 seasons side by side, you would get the impression that he’s been a very consistent player during his first two MLB seasons. Walk rate around 8%, strikeout rate in the low 20s, ISO around .190. Yet Piscotty’s 2016 was very much a story of two distinct halves, in which he had a 130 wRC+ in the first and a 98 wRC+ in the second. While the power was relatively similar in both halves, his command of the zone got much worse and he became much easier mark for opposing pitchers. Given that he’s shown some major-league aptitude and that he’s a 26-year-old on the Cardinals, one probably doesn’t want to bet against the 130 wRC+ version returning for 2017. Tommy Pham has dealt with injuries and now also faces a lineup that doesn’t have an obvious role for him. Yet Pham can hit for power and knows how to work counts, two things that often help you find work throughout the season. The projection systems don’t necessarily buy him as a power threat, but if he’s able to prove them wrong Mike Matheny will find a way to use him. Max Kepler followed his strong Double-A showing in 2015 with a fine performance in Triple-A last year, opening the door to his first sustained major-league action. While Kepler didn’t look like a star in 2016, he hit 17 home runs in 447 PA on his way to a 93 wRC+. He’s a good runner and showed decent discipline at age 23 and should continue to grow as the Twins everyday right fielder in 2017. The Twins have a young team all-around, and if Byron Buxton and Eddie Rosario get most of the reps in center and left, there’s a good chance it will be Danny Santana serving in the backup role for Kepler, although Robbie Grossman is another option. Santana can fly, although he hasn’t been about to re-create his BABIP-heavy 2014 campaign in either of the last two seasons, leaving him without much to offer if he’s called upon to fill in for an extended period of time. Carlos Gonzalez’s days as a potential superstar have likely passed, but the once fragile outfielder has been healthy now for two consecutive seasons and that’s enough reason to celebrate. While he hit fewer home runs in 2016 than he did in 2015, he mostly made up for it with more singles and doubles. It’s always a little hard to judge Rockies players because of Coors Field, but Gonzalez has had a pretty consistent profile over the years. If he’s found a way to keep himself on the field, the club will surely be okay with a slightly less dynamic version. The running question surrounding Gerardo Parra is what to make of his defense. If you follow the numbers, he was somewhere between pretty good and amazing prior to 2015 and then delivered one of the worst seasons of the decade, recording nearly -20 runs in the field. It’s hard to know exactly what to make of that. Generally speaking, though, Parra could be expected to offer near-average value at the plate and some flexibility when it came to his position on the field. Maybe he wasn’t any sort of anchor, but he was definitely worth having around. The first year of his three-year deal with the Rockies was a disaster, however. He posted a 56 wRC+ and didn’t do anything to make up for it on the bases or in the field. Parra is young enough — he turns 30 in May — to get back to place where he’s a solid role player, but he faces an uphill climb if he wants to start again in the near future. Nomar Mazara is one of those players about whom we’d probably be talking a lot more if Mike Trout hadn’t ruined us. Mazara tore up the minor leagues and then hit 20 home runs with a.320 OBP as a 21-year-old. Certainly, his overall performance of 94 wRC+ and 1.2 WAR don’t blow you away, but most players his age aren’t starting for a contender in the majors. If Mazara can get his raw power into the game, he’s going to be a force — potentially as soon as this season. We have Shin-Soo Choo listed behind Mazara in right field, but that’s probably only going to be the case if things are going particularly well for the Rangers. If everyone’s healthy and performing, you could imagine Choo cycling through the outfield a few times throughout the year, but if Mazara goes down for any extended period of time, it seems more likely that someone like Ryan Rua would get the reps in the outfield that Choo’s body probably can’t endure on a regular basis. Rua doesn’t bring a particularly compelling body of work to the table — 90 wRC+ in 464 career PA — but if you can line him up mostly against lefties, he might look like an average player. You would notice Aaron Judge if he walked into a room, and you would certainly notice him standing 60 feet, six inches from you in a batter’s box holding a wooden club. Judge’s size is imposing and it’s that large frame that gives him immense raw power — power that hasn’t yet shown up between the lines. He’s raked in the minors, but his home-run numbers haven’t been off the charts and his high minor-league strikeout rates are a bit troubling. Judge will be entering his age-25 season after a 95-PA trip through the majors last season, but the projections aren’t expecting great things, at least just yet. The potential is there for a 40-homer season, but he also might wind up striking out 30% of the time. Aaron Hicks is currently in line to be the Yankees’ fourth outfielder and should likely see work at all three spots during the 2017 campaign. Hicks was a well-regarded prospect who was drafted 14th overall in 2008, but three of his four major-league seasons have been less than impressive. Even during his best season, 2015, he was a roughly average player. Hicks will hit some home runs, but he’s generally been an underpowered, low-BABIP hitter who doesn’t stand out on defense. He’s still only 27, but it’s hard to find a path for him that would end in an above-average season. If all else fails, Clint Frazier lurks in the minors. As I reviewed the Mariners’ roster for the 2017 season, a feeling of excitement came over me. They have a strong core and, if you squint just right, their surrounding talent has the look of a Wild Card contender. If the Mariners are chasing a playoff berth down the stretch, chances are it will be in part because guys like Mitch Haniger provided some value around the edges. Haniger had a brief stint with the Diamondbacks last year and was a less flashy part of the winter’s big trade between Seattle and Arizona, but his minor-league numbers have been impressive lately, featuring evidence both of power and on-base ability. Haniger is one of the players whom the fans think will be much better than his ZiPS and Steamer projections, in large part because they’re buying the power. He hit 20 home runs in 312 Triple-A plate appearances last year, although that comes with a PCL caveat. Guillermo Heredia is another one of these backup right fielders who will probably get more of his chances sharing time in left. Regardless of where we find him, he remains a very interesting player in his first full season in the majors. Heredia has been an on-base machine so far in the professional career and mixing that skill with quality outfield defense makes him an asset for a Mariners team that just might make things interesting. Lonnie Chisenhall doesn’t exactly fit the profile of a corner outfield. He came up as a fairly well-regarded third-base prospect, but life often has other plans, as it did for Chisenhall. Chisenhall is aggressive, swinging way more often than the average player, although he makes it work because he’s able to make a fair amount of contact. The lack of walks and ordinary pop means his success is largely dictated by how well his BABIP looks at the moment. If you trace his numbers over the years, you find that’s generally the case. He’s a solid runner and an adequate defender, so you can count on him for about an average season, but there isn’t much there in terms of upside for the 28-year-old. If you had to pick a single baseball skill at birth, the best bet is probably fastball command from the left side. But if you limit your choice only to position-player tools, you’d probably pick the ability to get on base. If a batter gets on base enough, they’ll find a place for him in the majors, which is exactly how Brandon Guyer has found himself with steady work over the last few years. Now Mr. Guyer hasn’t exactly done it the easy way, as he’s provided that extra OBP largely through his ability to get struck by the baseball. He’s the HBP champ of the league, and while he makes a decent amount of contact and has some power, a person with his skills but a normal HBP rate probably isn’t going to get 300 PA for a championship-caliber club. Hopefully David Peralta has good self-esteem and isn’t looking to baseball-related media for validation. Because, while Peralta is coming off an injury-shortened year that followed a great 2015 campaign, his particular case isn’t even the best example of that narrative arc in his own outfield. Peralta finishes second to A.J. Pollock in that regard, but he’s a compelling player in his own right. While his home-run totals have been solid, it’s been those 24 triples in just over 1,000 PA that have padded his stat line. If he’s back at full strength in 2017, expect something closer to 2015 than 2016. To answer the question of who is backing up Peralta in right field, you essentially have to ask who isn’t playing left field at the moment. As the Diamondbacks spread some reps around to keep Peralta and Pollock fresh, it will be a rotating cast of Yasmany Tomas, Socrates Brito, and Oswaldo Arcia filling in. Tomas and Arcia are power threats, and Brito probably asks a lot of really interesting questions in the dugout. If you scan the Rays depth chart, you’re likely to come away with one of two impressions. Either the Rays are staying #onbrand and utilizing some sort of platoon at six or seven sports, or the FanGraphs staff has no real idea who’s going to get playing time for the club beyond the opening week. How this manifests itself in right field is with Steven Souza sharing time with Corey Dickerson and Nick Franklin, all of whom have their talents and their warts. Souza’s minor-league numbers were excellent, but he simply hasn’t been able to hit for enough power to make up for the very troubling strikeout rate. Rather than being four-plus-win player as some envisioned when he was traded to Tampa Bay, he’s settled in just above 1 WAR in each of the last two seasons. The move from Coors to Tropicana gave Dickerson some trouble at first, but when all was said and done, he had swatted a career-high 24 dingers, albeit in a career-high number of trips to the plate. He’s best suited for the strong side of a platoon, but we figure he’ll get quite a few at-bats splitting time between DH and RF. Franklin looked solid in very limited time last year, so keep an eye on him as he finally tries to put something together several years after the prospect shine vanished. I will admit that I haven’t exactly watched a ton of Reds baseball over the last couple seasons, and when I do find time for it, it’s usually just Joey Votto walks on repeat. I say that to explain how, if it turns out Scott Schebler is merely a player invented by Carson Cistulli and not actually a real human, there’s no way I could have confirmed or denied it. Scanning his minor-league numbers indicates he probably has more power from the left side than he’s shown in the majors. With a small park guaranteed for half his games, you could imagine a solid home-run number. Adam Duvall and Ryan Raburn will probably be the ones getting most of the chances in right that don’t go to Schebler, seeming to indicate that the Reds might have a type. If you can hit for power, but aren’t super great at making contact, it might be worth sending a tryout tape to GABP. It’s safe to say we’re beyond the years of reflexive Moneyball takes, but it’s really hard to write 7,000 words about a single position so I hope you’ll indulge me. Matt Joyce went out and walked a ton in 2016 and then Billy Beane and the A’s came knocking. Joyce has always been a worthwhile role player, save for his terrible 2015 season, but he became extremely patient last year and walked more than 20% of the time, posting a 137 wRC+. He’s been a pretty safe bet for something just below two wins a season. If he delivers that for $5.5 million, the cost-conscious A’s will be thrilled. The 2015 version of Mark Canha would be a perfect, nondescript platoon mate for Joyce, so it’s just a question as to whether he will be the version who shows up in 2017. He had a poor showing early last year and then had season-ending hip surgery in May. If he’s at full strength, the duo will certainly earn their keep. I’m not totally sure how the Orioles are going to sort out the playing time for Seth Smith, Mark Trumbo, Pedro Alvarez, Joey Rickard, and Hyun Soo Kim, but however that rotation shakes out I feel pretty confident that you can take the Seth Smith projection to the bank. You can write him down for an above-average walk rate, average strikeout rate, and above-average power. He’ll ride that to a wRC+ around 110 and he’ll do it mostly against righties. Death, taxes, Seth Smith. Trumbo figures to see more of his plate appearances at DH rather than right field. No matter where he is, though, you can expect some dingers and some strikeouts. He’s a little more dynamic than Smith in that regard, but he’s predictable in his own way. If you can keep Michael Saunders healthy, chances are you’re going to get a couple wins of value from him thanks to a nice mix of on-base ability and power. He’s not going to blow you away with any single skill, but he has enough on every skill slider to make him a solid major leaguer when healthy. Aaron Altherr is definitely deserving of another look despite his rough 2016 performance. He broke his wrist in spring training and couldn’t get going when he came back later in the year. He has some raw ability and was once an interesting prospect. He’ll get to bounce around the outfield this year as he finds his legs, perhaps working himself back into shape for a starting job in 2018. I will admit to having fact-checked my colleague who handles the Mets depth chart because, on its face, giving this much time to Jay Bruce when you have Michael Conforto is a little bewildering. Now maybe it’s as simple as the Mets figuring they should see what Bruce can offer before making any irreversible roster move. Maybe it’s as simple as Terry Collins liking how 33 homers and 99 RBI look on Bruce’s baseball card. Maybe it’s as simple as Bruce’s wRC+ in 2016 being better than Conforto’s. Yet it seems like an honest accounting of the situation would tell you not to put too much stock in Bruce’s good 2016 first half compared to his broader body of work. There are plenty of worlds in which Bruce has a better year than Conforto, but Conforto is a young player on the rise who projects better than Bruce this year. And that’s before you get to the matter of defense, where the numbers and the eye test tell you Conforto brings more to the table. It’s a rough tool, but if you just prorate our ZiPS/Steamer blend over 600 PA, Conforto beats him at the plate and outpaces him by more than two wins of value. Jorge Soler has had plate appearances in three different MLB seasons, but he only has a little more than one full season of work under his belt (765 PA). He burst onto the scene in 2014 with a 148 wRC+ in 97 PA after tearing up the minors. Even with his free-swinging ways tempering reasonable expectations, it was hard not to dream about another potential force in the developing Cubs juggernaut. He crashed back to earth in 2015 (96 wRC+) and wasn’t a ton better (106 wRC+) during an injury-shortened 2016. If you look at his entire body of work, he’s only hit a little better than average in the majors, but if you look at how he performed across multiple levels in 2014, you can imagine how he could be frightening again very soon. The flip side would be to look at his contact issues and to play the percentages. Most guys who swing and miss this often don’t wind up being stars. The Royals took a gamble this winter, trading Wade Davis to get him, but if they get Soler on track this is definitely one of the spots where they could beat their projection by a sizable amount. Paulo Orlando definitely won’t have trouble making himself useful as a runner and defender, but his ability to impact the game in the box is somewhat less certain. Repeating his 95 wRC+ in 2016 would make the Royals very happy, but he built that performance on a .380 BABIP. Even with his wheels and tendency not to put the ball in the air, keeping it that high is a tall order. This part of the list starts to get a little repetitive, as the story with Domingo Santana is similar to a lot the guys around him: he’s a flawed player who has enough talent that you could imagine a breakout. Santana hits the ball very hard but often fails to make contact when trying to execute that particular move. He has 19 homers in 486 career PA, but his career MLB strikeout rate is also near 35%. He raked in the minors but the pitching is tougher in the show, and he doesn’t offer enough speed to support his game in that regard. If he makes enough contact, the quality of his contact will carry him up this list. If he doesn’t, the Brewers might get a win of value. As the Brewers rebuild, they’re running out a group of guys with potential and a group of guys whose potential never materialized. Hernan Perez isn’t quite sure to which group he belongs. He’s about to turn 26, and while he didn’t do much to open eyes while serving as a Tigers farmhand, he hit well enough last year for his speed to make him a useful role player in Milwaukee. He’s probably not going to be a starter on the next good Brewers team, but he’s also probably got enough talent to contribute during the bridge years. Kirk Nieuwenhuis is definitely on the post-potential side of the hill, although he provides enough power and patience to keep him in the mix for playing time despite his strikeout problem. Much like Soler and Santana, Hunter Renfroe is a young slugger with the potential to shake up this list. In his minor-league career, he hasn’t exactly demonstrated an advanced approach, but he has crushed the ball at basically every stop. If he makes enough contact in his first extended look in the majors, he has the potential to have a big impact. Christian Bethancourt is obviously the most interesting player in baseball. It’s not even close. Mike Trout? Buster Posey? Forget it. Bethancourt is going into 2017 slated to catch, play outfield, and collect some innings out of the bullpen. Will it work? That depends on if he can command his fastball, but the flexibility such a player would offer has all sorts of benefits downstream. We’re all counting on you to put this idea in the heads of more front offices and managers, Christian. Remember how I said there’s a common thread among Soler, Santana, and Renfroe? Nick Markakis is the opposite of that. Markakis is one of the most predictable players in baseball. You can put him down for a 155 games, 10-15 home runs, a decent number of walks, low strikeout totals, and a pretty average BABIP. I should have saved the death and taxes joke for him. Markakis is 33 years old and has roughly 25 career WAR, so the Hall of Fame might not seem likely until you realize he can probably keep this pace for another 20 years. One of the reasons the Braves are the Braves is because there isn’t a whole lot of depth. Behind Markakis, who has a relatively low ceiling, are guys like Chase d’Arnaud and Emilio Bonifacio. Both of them are fast? So, listen: Rymer Liriano’s projection isn’t great, and his 2016 debut doesn’t inspire confidence, but he’s only 25 and has had plenty of success in the minors. Rebuilding teams aren’t supposed to have great players, and the White Sox don’t have the problem in right field, but Liriano could BABIP his way to respectable showing. Avisail Garcia is going to keep getting chances because he’s young and looks the part of a slugging outfielder, but he has really failed to deliver in the majors. He has a career 89 wRC+, a below-average walk rate, and limited in-game power. If he played excellent defense, he’d have a nice little career ahead of him, but unfortunately that isn’t the case. We hoped you liked reading 2017 Positional Power Rankings: Right Field by Neil Weinberg! Today I learned that Scott Schebler exists.